MILA Solutions, LLC, formed in 2007 to provide the aerospace community with media products, strategic communications and project management services. MILA is pronounced MY-luh, and is an acronym for the Merritt Island Launch Annex, the earliest name for the area that eventually became the Kennedy Space Center. The area also gave its name to the MILA Spaceflight and Tracking Data Network Station, which was established in 1966 and supported launches from the Cape until it was closed in 2011 following the conclusion of the Space Shuttle Program. There's another reason why the company is named MILA Solutions, but you'll have to ask about the story. MILA Solutions' current and past clients include NASA, the Space Foundation, WMMB-AM radio in Brevard County, Delaware North (operator of the Kennedy Space Center Visitor Complex), the Coalition for Space Exploration, Space Florida, United Space Alliance, The Astronauts Memorial Foundation and news publications including the National Space Society's Ad Astra magazine and Space.com. We've even helped a friend or two in building and managing their websites. If you have a special project that could use a fresh, creative approach; or writing that needs to be done -- whether for a press release, a feature in your company publication, or for your website -- feel free to send us a note at jbanke@milasolutions.com so we can talk about it and get things done for you quickly and with quality. 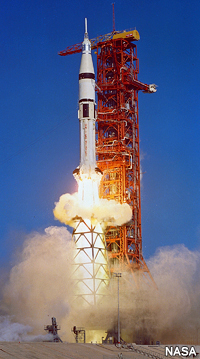 Pictured here is the launch of an Apollo Saturn 1B from pad 39B at the Kennedy Space Center. It's one of the coolest looking rockets in space program history. Jim Banke is an award-winning, veteran communicator with more than 30 years of experience as an aerospace journalist, writer, producer, consultant, analyst and project manager based at Cape Canaveral, Fla. In 1987 he earned a B.S. in Aviation Business Administration from Embry-Riddle Aeronautical University in Daytona Beach, Fla. In 2014 he earned an M.S. in Space Education, also from Embry-Riddle. Previous employers include Florida Today, Space.com, the Space Foundation and SAIC. As co-creator of Space Online in 1995, Banke was an early pioneer in online news reporting. While at the Space Foundation from 2004-2006, he helped manage the Coalition for Space Exploration, an industry team dedicated to winning support for space exploration. His expertise and experience with the space program was recognized in 2006 by Gov. Jeb Bush, who appointed him to the Governor’s Commission on the Future of Aeronautics and Space in Florida, which led to the creation of Space Florida, essentially the state's space agency. Banke was honored by NASA in 2007 with a Distinguished Public Service Medal, the agency’s highest award for a non-government employee; and by the National Space Club Florida Committee in 2011 with the Harry Kolcum News and Communications Award. In 2014 he was inducted as a member of the Alumni Hall of Fame for Burnsville High School in Minnesota, where he was an active student leader. As a journalist, Banke received a variety of writing honors by Florida Today and its parent company, Gannett. For their work on Space Online, the Internet's first news site dedicated to space news, he and his colleagues were honored with the 1996 Digital Edge award for best online newspaper from the Newspaper Association of America, as well as a 1997 Editor and Publisher's award. In 1988 he was part of a writing team that earned a prestigious Robert S. Ball Memorial Award from the Aviation and Space Writers Association. In 2003, as a writer/producer for space.com, he was honored with an Online News Association Award for Breaking News – Independent, for team coverage of the Space Shuttle Columbia tragedy. As a NASA contractor who is part of the Aeronautics Research Mission Directorate's strategic communications team -- a role he continues to serve in today -- he has received the agency's Group Achievement Award three times. The Minnesota-native is now owner and president of MILA Solutions, LLC, providing strategic communications, media products and project management services to the aerospace industry. For more than 20 years Banke has provided live commentary for Cape Canaveral-based launches on WMMB-AM radio, and from June 2009 to April 2013 he hosted "Space Talk with Jim Banke," a weekly radio show about the space program. His contributions to the local community include serving as Secretary for the U.S. Air Force Space & Missile Museum Foundation and as a member of the board of directors of the National Space Club Florida Committee. Jim and his wife, Dawn, have been married since 1983, have three grown children, three granddaughters, and remain loyal fans of the Minnesota Vikings.